Home | LITFL | Clinical Cases | Why so blue? A 40-year-old man presented to the emergency department with shortness of breath, chest pain and reported a pre-syncopal episode. On questioning he reports increased lethargy, weakness, pallor and an occasional blue hue to his hands over the past two weeks. He has a past medical history of hypertension, unprovoked PE and SLE unresponsive to first line treatments for which he has recently started new medications. Q1. 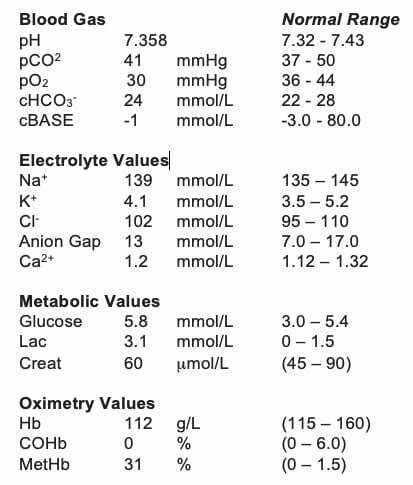 Here is the venous blood gas result on arrival. What does it show? Q2. What are the clinical features of this condition? Q3. What is the initial management? Note: the methaemoglobin level is expressed as a percentage of the total haemoglobin level. Therefore this is relative based on the patient’s total haemoglobin level. 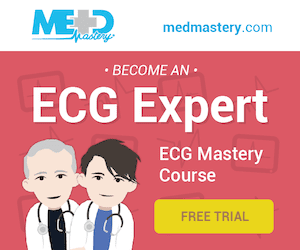 If a patient has a raised methaemoglobin level but less than 20% and is symptomatic you may wish to treat on clinical grounds. Q4. Are there any specific considerations in the management of this condition? In acquired methaemoglobinaemias secondary to drug ingestion, such as Dapsone, consider activated charcoal. Dapsone has active metabolites that undergo entero-hepatic circulation therefore you may require multiple-dose activated charcoal (MDAC). Sulfhaemoglobin can cause similar symptoms and be erroneously detected as methaemoglobin by co-oximetry. Sulfhaemoglobinaemia will not respond to Methylene Blue. Q5. What is the likely cause in this patient? Acquired methaemoglobinemia secondary to Dapsone. Q6. What other commonly used medications can cause this? Q7. Other than medication what other causes are there? Q8. What is the basis for this condition? Josef T Prchal, MD. Clinical features, diagnosis, and treatment of methemoglobinemia. UpToDate. November 2018. Darling R, Roughton F. The effect of methemoglobin on the equilibrium between oxygen and hemoglobin. Am J Physiol 1942; 137:56.